Born in Toronto, Kim Cain relocated to Nova Scotia in 1995. She began her studies at the Nova Scotia Collage of Art and Design and her career as an exhibiting artist. Her work has been shown in various group shows: In This Place (1996), Skin (1998), Sistervision II (1998), Far and Wide (2000), Beyond 2000: Art of Bob Marley (2000) and Sistervision III:Through Others Eyes (2001) held at the Art Gallery of Nova Scotia. Her work was also exhibited in the Africville reunion show (2010), the Freedom Festival (2011 and 2012) and SisterReVision: Reclaiming the Black Female Body (2014). Her first solo show, The Bridge: A Visual Biography was held at the Anna Leonowens Gallery in 1999. Her second show, Artmomma Resurrected (2008) was also hung at the Anna Leonowens Gallery. 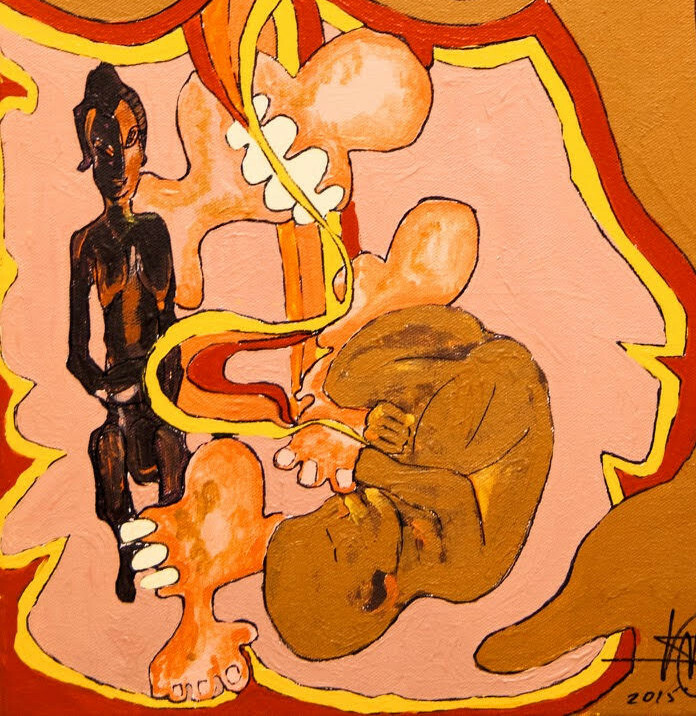 Artist Statement: The Fetus, the Fibroid and Fertility God is from a series of work that deals with fibroids and how they can create problems for women. I became aware of complications connected to the fibroids that crowded my uterus during my last pregnancy, after being hospitalized due to the fetus (my daughter) and fibroids fighting each other for space and blood. Artist Statement: The Fetus, the Fibroid and Fertility God is from a series of work that deals with fibroids and how they can create problems for women. I became aware of complications connected to the fibroids that crowded my uterus during my last pregnancy after being hospitalized due to the fetus (my daughter) and fibroids fighting each other for space and blood. i am deeply affected by your story and my tears keep on flowing. i have a lot of things to say but cant find the right words to express them all. these thoughts, keep on flowing through my mind and heart too fast for me to write them down. But i feel i must say something about how i feel as a man who shares gender with those foregone men who for a variety of reasons committed abuse on your mother and grandmother and many other women, and that is that i am very very sorry. I sincerely apologize to you on their behalf, to you and all the women who are going through such ordeals. i pray for your steady healing, you and your daughter and all other women. i pray that we as people learn to identify and eliminate all the causes of abuse in our homes, work, community, places of worship, schools, … etc.